Life Before the Dinosaurs: Arthropleura. 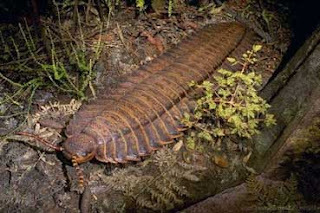 Arthropleura was a seven-foot millipede that lived in the Carboniferous Period. The Carboniferous Period also had a lot of other giant arthropods. The name is pronounced arthro-PLEW-ruh. 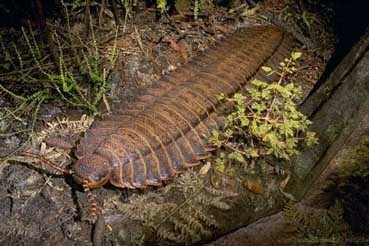 Arthropleura could literally stand up, half of it pointing up in the air, and half of it on the bottom holding it up. 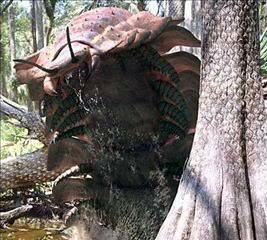 Even though Arthropleura ate ferns and other plants, it did have strong mandibles that could really injure someone. The reason the giant arthropods were alive only in the Carboniferous Period is because the whole entire world was either ocean or a swamp. Swamps are usually known to have millions of plants, so imagine if the whole world was covered in a swamp. Then there'd be a lot of oxygen, because plants make oxygen. An arthropod would have trouble getting the oxygen to all its different parts if there wasn't enough oxygen, so all the oxygen would allow the arthropods to get very, very big. I don't think that's scary at all. I think it's amazing, and sad that we don't have it around anymore. Just wait'll you see one in the back yard or the tub or running under the dryer. That is kind of funny!!!!!!!!!! Are you sure you're only seven years old? You write better than a lot of university students I've taught....But more importantly, this is a wicked-cool arthropod. 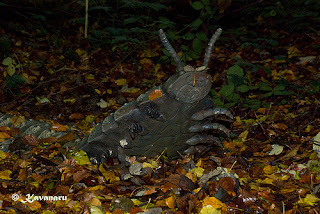 @TGIQ: I'm sure that I'm really seven years old, and I also think that Arthropleura is really cool, especially the fact that it's seven feet long and that it can stand up like that! I was wondering if I could use one of the pictures for educational purposes? I couldnt find any authorship rights? When Art created these posts, each image was linked to its source and authorship information was found by clicking the photos. Unfortunately, the links for these particular images no longer go anywhere. I believe the middle image is a still from the BBC documentary Walking with Monsters. tanks a lot, I will check that further. Dude! Those photos are totally 100% fake. 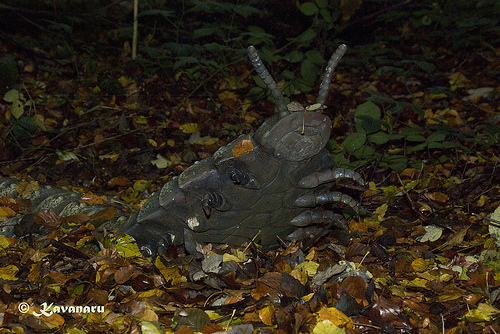 If you could forward some real photos of live Arthropleura, that would be much appreciated! You should totally start your own blog. Give me the URL and I'll leave you some very helpful anonymous comments. But not if you're seven. If you're seven, I'll leave you alone. I found this entry while searching for pictures of Arthropleura. I think the whole Internet deserves to know this is pretty much the best way to respond to an anonymous troll on your kid's page. Good job! That thing is really cool, although if those things still lived today I think it would pose some problems like if it wandered into cities. I guess there would Arthropleura crossing signs. Its great to see though that there is a kid out there these days that shows interest in learning.